Getting Married? Let the Moon Phases Inspire Your Special Day! There are 365 wonderful days to get married on every year. And narrowing it down to one specific one is the challenge for brides everywhere. An entire arm of the wedding industry is actually devoted to helping you pick out your wedding date! What a lot of people don’t consider is the effect the moon has on their wedding. Some people take it the whole 9 yards and hire a professional astrologer to plan out the best day for both bride and groom to be married. Though, most people think that’s taking it a step too far. Using the Moon Phase Calendar to pick out your big day! If you’re considering the moon for your wedding, but not going to devote a section of your budget to an astrologer, take these few tips in mind. It’s best to accept a wedding proposal during the full moon phase. The ancient Greeks believed that consummating a wedding on a full moon made the marriage destined for bliss, wealth, and great harmony. New moons are said to be times of black magic, so if you were married beneath a new moon phase you would be exposed to more curses. The first quarter phases are great times for new beginnings and as such, the perfect time to tie the knot. Waning phases are for closing out experiences, finishing projects, and bringing things to an end. It is imperative to avoid these phases when it comes to the timing of your wedding day. Check out a full guide to the moon phases by clicking here! 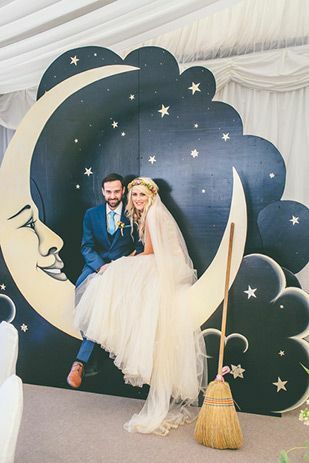 IF you’re considering the moon phase at all for your wedding plans, why not take the idea all the way and make the moon your wedding’s theme? There’s a lot more to the moon and your wedding than the superstitions will let on, and it all starts with some amazing decorations. Using the moon phase of your wedding date or the classic waxing crescent motif on invitations, napkins, or maybe even as your cake topper is a really clever way to sneak some of your personal style into the wedding of your dreams. The waxing crescent is the classic moon sliver that is very aesthetically pleasing for design purposes, and quite often people draw the profile of the man on the moon into the shape of the moon. Superstition wise, the waxing moon is the time for new beginnings, and is a great moon phase to associate with your wedding. If you really want to make the wedding shine like the moon in the sky just take the plunge and have your wedding by the light of a full moon! Set it up so the natural full moon is your backdrop to your wedding vows. Just line the aisle with some candles so you can see the way and your guests can see to their seats, maybe use some lit candles around yourselves while you say your vows so you can see the look on your new spouses’ face when you say “I do” and kiss for the first time as husband and wife. But planning for the perfect full moon phase moment in that way might be a bit too much—and that’s really fair. Having a wedding in the middle of the night like that can just be too daunting and challenging to arrange. Not to mention all of the limitations that just can’t be avoided: children won’t be able to attend, it’s going to be after dinner so your choices of food are going to be limited. You won’t be able to see anything. Your pictures are going to be a very specific style and that style might not last the way you want them to. Looking for a great place to start? Check out this pinterest page with the moon phase ideas already up for you. If you’re having a small wedding, or eloping, saying your vows beneath the light of the full moon could very well be the most romantic and memorable wedding style. Any pictures you get will be stunning and have that great improvised feeling. And maybe most importantly: whenever you look up to the full moon you’ll remember that perfect night when you got married. For all else, there are other ways to incorporate the moon into your wedding, even if it starts a bit earlier in the day. So do not fret fellow lovers of the moon! If your wedding goes into the night, see about opening up a patio, garden, or balcony area in your reception venue for a romantic moonlit area. Let the music drift out there, and use the light of the moon shine down on the dancefloor! Or maybe you can set it up as the backdrop for a second round of photos to add to your album. With the moon as back lighting it would give your pictures an ethereal silhouette form that very few ever get the chance to achieve in their wedding photos. The coolest moon phase prop for your wedding ever. This is the final suggestion for your moon-inspired wedding. These are supremely cool photo-booth style seats shaped like the waxing crescent moon! The basic shape is simple: the façade shaped like the moon, and the seat for the photo subjects to sit on for picture time. The rest of it, the design of the façade, is completely up to you! It is completely customizable and only limited by what you can and are willing to paint onto it.